Located in Northern California is an All-American town called Lincoln. I remember driving through Lincoln many times back in college on my way from Chico State to Lake Tahoe. It was a sleepy little train town that you might miss if you blink on your drive down highway 65. But over the year’s it’s grown and now Lincoln even has an award-winning brewery, Knee Deep Brewing Co. 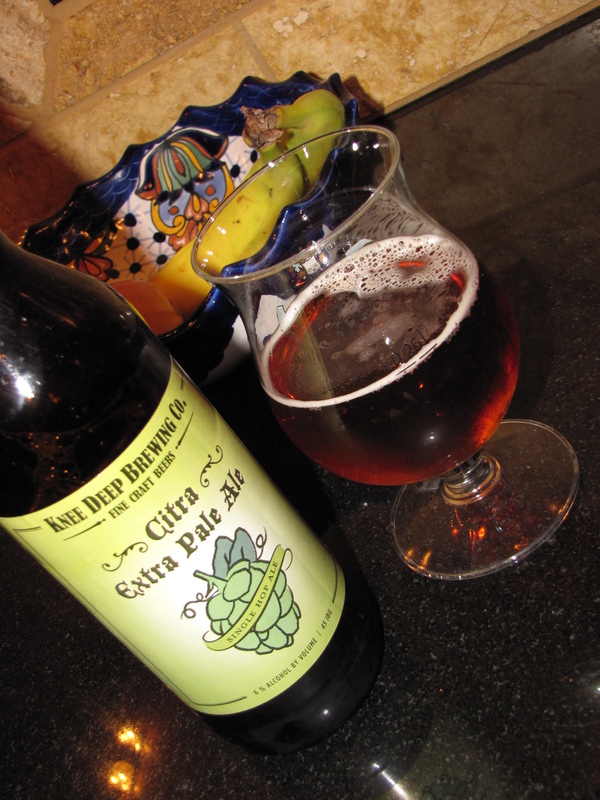 I had a chance to try the single hopped Citra Extra Pale Ale over the weekend. A single hop, west coast style American Pale Ale with intense hop flavor and aroma’s. This is a citrus bomb that has grapefruit and passion fruit aroma’s with citrus lime flavors. Citra pours a nice reddish copper color with very little head. It has a fruity sweet floral nose to it. It’s a well-balanced brew, with a great malt backbone that isn’t overpowered by the Citra hops. It’s an interesting beer, and more complex than a typical Pale Ale. Perhaps, that’s what makes this one “Extra”. This is one of the first “single hop” ales I’ve tried so I don’t have much to compare it to other than other Pale Ales. So I’ll just say that I enjoyed it, but it got a little too floral and sweet near the end for my tastes. I’d suggest that you split a bottle with a friend and then follow it up with a hop bomb of your choice. (I would recommend a Knee Deep Hoptologist DIPA). 3.5 beer soaked caps from me. P.S. I found this one at Korker Liquor in Corona Del Mar. 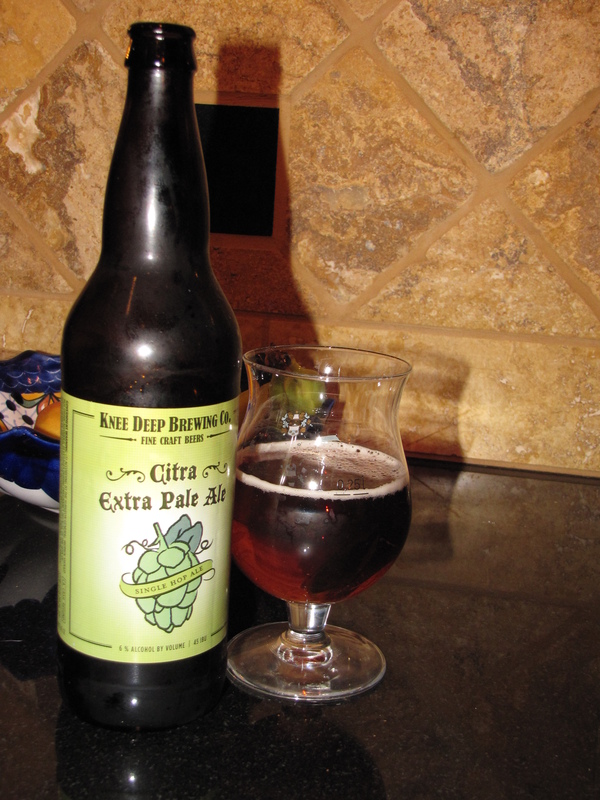 This entry was posted in Ale, American, Craft Brew, Pale, Review and tagged American, Citra, Extra Pale Ale, Knee Deep by Erik. Bookmark the permalink.